Two-photon micropatterning, a photo-induced degradation process, enables the engraving of fine three-dimensional structures into hydrogels. These structures can then be repopulated with cells to study, for example, cellular migration and substance transport in vascular structures. Scientists from TU Vienna developed a way to improve hydrogel sensitivity, thus greatly enhancing the efficiency of two-photon micropatterning. The study has now been published in Angewandte Chemie (International Edition). 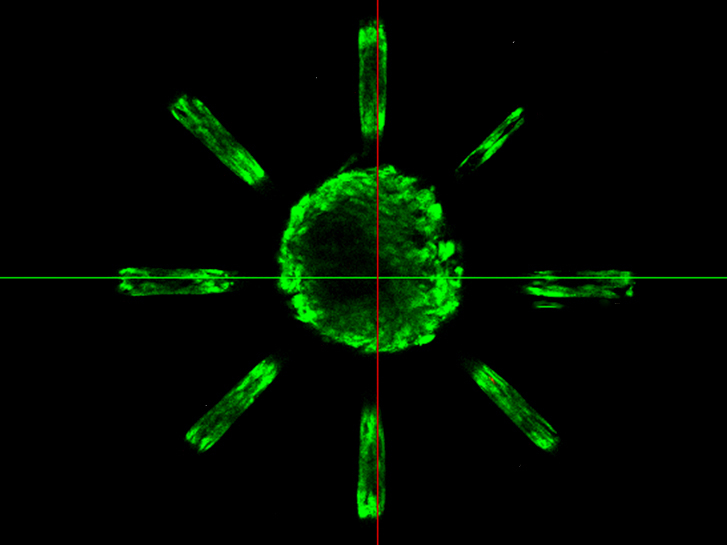 “Hydrogels act as three-dimensional mesh for the cells to adhere and find support”, explains Markus Lunzer from TU Vienna, “For the cells to act in a desired way, hydrogels often have to be manipulated at a micrometer scale – for example by adding channels providing space for cellular migration or nutrient supply.” Therefore, a linker in the hydrogel backbone can be cleaved via two-photon degradation, generating open spaces with high precision. The process is, however, usually inefficient and slow. By adding a photosensitizer, a molecule aiding in transferring the light’s energy to the hydrogel, the process can now be completed significantly faster – or at the same speed, but with reduced energy, explains Aleks Ovsianikov. Reducing the energy allows for photodegradation in the presence of cells inside the hydrogel that might otherwise be damaged by strong irradiation. The sensitizer is manufactured at the lab of Professor Liska. The discovery was enabled by a close collaboration of scientists from different fields at TU Vienna, where the Institutes of Materials Science, Applied Synthetic Chemistry, and Lightweight Design and Structural Biomechanics were involved, and partners at the University of Uppsala – underlining once more the great potential of interdisciplinary research. Further reading: Lunzer et al., A Modular Approach to Sensitized Two‐Photon Patterning of Photodegradable Hydrogels; Angewandte Chemie, 2018.